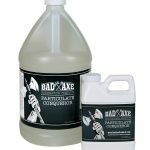 Bad Axe ONSLAUGHT Disinfectant is an EPA registered disinfectant ideally suited for mold remediation and water restoration projects. 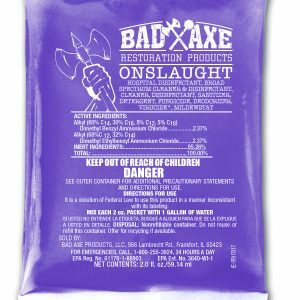 ONSLAUGHT’s quaternary ammonium chloride formulation also functions as a fungicide, virucide, bacteriocide, cleaner and sanitizer. ONSLAUGHT offers a broad spectrum of kill claims for nearly 140 commonly occurring pathogens making it ideal for disinfecting surfaces in hospitals, public transportation, schools households and public and private structures. ONSLAUGHT is registered for both porous and non porous surfaces. 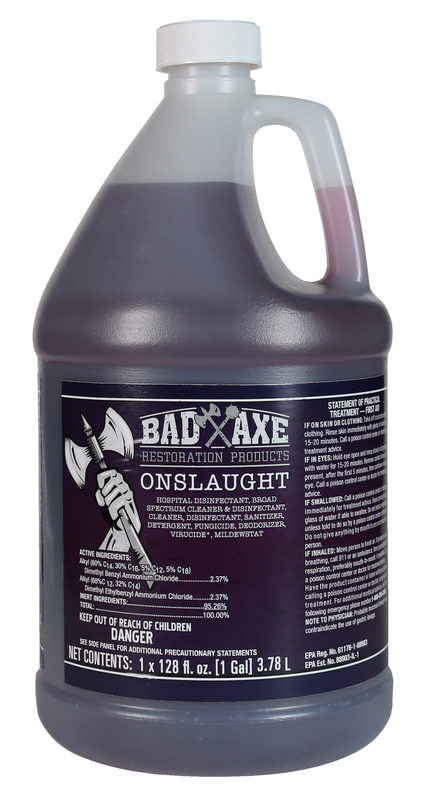 Bad Axe ONSLAUGHT Disinfectant comes in innovative premeasured packaging. Why is that so important? 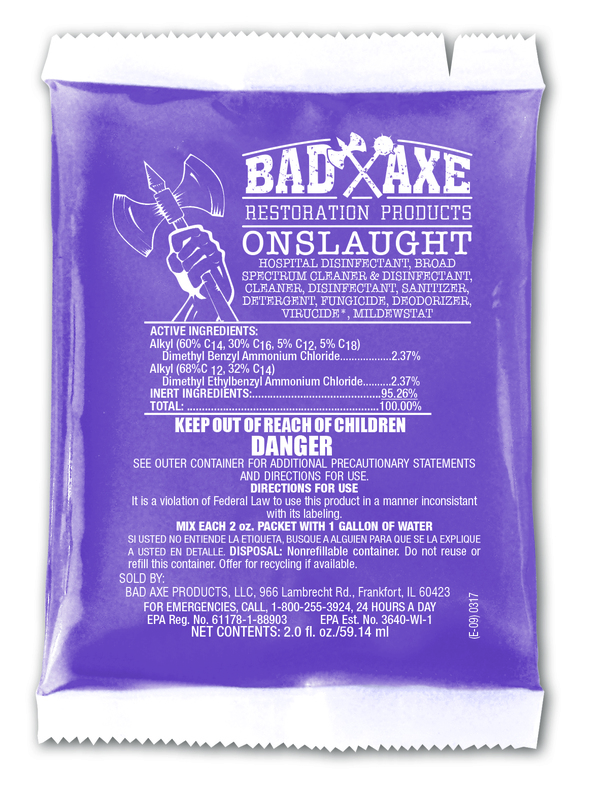 ONSLAUGHT is innovatively packaged in premeasured packs. Precise measuring guarantees accurate-strength solutions every time. ONSLAUGHT premeasured packs allow your staff to accurately mix anywhere in the facility. 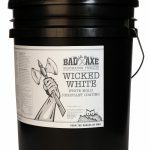 ONSLAUGHT premeasured packs eliminate the complexity and wasteful over-mixing associated with gallons, pails, and drums. ONSLAUGHT premeasured packs save untold amounts of time and money by reducing waste, simplifying training, and doing a better job faster – the solution for worker productivity and consistent results. ONSLAUGHT efficacy is based on the “carrier” method, which requires complete kill of all target cells on all carriers. 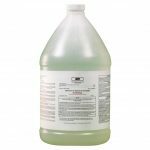 Other disinfectant companies only follow the criteria to satisfy suspension methods, which require only “partial” kill (e.g. 5-log kill of target bacteria within 5 minutes) to demonstrate the needed efficacy to satisfy regulatory authorities. ONSLAUGHT is registered and tested in real world conditions consisting of 98% soil-load (fetal bovine serum) tolerance in approximately 800ppm hard water. 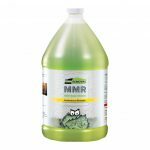 The testing regime of many competing products only meets the minimal government requirements of five percent organic soil load tolerances in 300ppm hard water conditions to prove their label claims. Neither humans nor animals self dilute these potentially pathogenic fluids down to only 5%. Instead secretions and excretions come out of the body at potency of 100% onto a surface. Testing at such a ridiculously high load demonstrates that ONSLAUGHT “kills beyond the standard” and shows durability outside of the label requirement. This built-in redundancy becomes a safeguard against operator error. Our formulation has undergone extensive testing from both global independent testing laboratories; as well as by foreign governments to verify their effectiveness against a wide range of pathogens including: Enveloped and non-enveloped human and non-enveloped human and non-human viruses, gram negative/gram positive clinical bacterial isolates, environmental and pathogenic fungi, and antibiotic resistant gram positive and gram negative bacteria, human viruses, gram negative/gram positive clinical bacterial isolates, environmental and pathogenic fungi, and antibiotic resistant gram positive and gram negative bacteria.